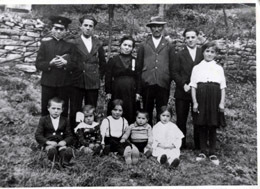 It was raining heavily on that 1st of October in 1958 when Giuseppina Piasente left Pieve Tesino in the Province of Trento to take a trip in Italy. 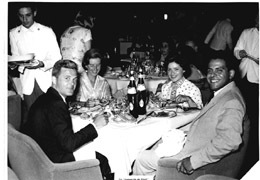 At that time she worked in a bar that she had bought with her brother Marino. It was time for her vacation, and a little rain, she said, certainly was not going to stop her from going. She had worked for 2 years as a waitress in Venice, and she wanted to get back together with some of her friends who were part of her life when she lived there. She decided to first visit a friend in Villafranca, but she was so excited about getting away that she got on the wrong bus and after a couple of hours ended up in Padua. Rather than get overly bothered by the situation, she went to visit the Basilica of Saint Anthony, or “the Saint” as he is commonly referred to in Padua. Then she decided to continue by train to Venice. It was on that train that she met Byron Alvarez, her future husband, an American who was on vacation in Europe. Destiny! The trip from Padua to Venice was very short, but it was long enough for the young couple to build a strong liking for each other. Next to them on the train, there was a couple from Hollywood that acted as interpreters. This way Byron was able to tell Giuseppina about his job as a typographer in a large company as well as in his own small, print shop. He told her about how his brother died in 1944 when his plane was hit by enemy fire near Anzio, Italy. She told him about how her father died when she was only 8, about her art studies in Florence, about her dream to become a costume designer and about her work in Pieve Tesino. That evening they had dinner together in Venice, at Ristorante San Giorgio, where a very accommodating waiter acted as an interpreter, and it was there that they exchanged addresses. Actually, Giuseppina, who had a collection of postcards, asked Byron to send her one from San Francisco. He began sending messages and presents right afterwards, first from Sorrento and Naples and then from San Francisco. This exchange of correspondence became part of their lives. Byron wrote his letters in English; an English teacher translated the letters for Giuseppina, the same one that also gave her language lessons. Giuseppina wrote back in Italian; Father Vittorio Bazzanella and Father Efrem Trettel of the Parish of the Immaculate Conception in San Francisco translated them for Byron, who had fallen madly in love. 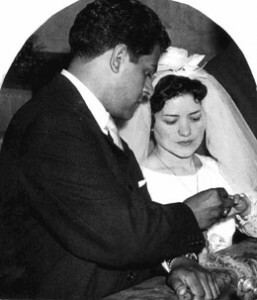 In 1959 Father Efrem arrived in Pieve Tesino with an engagement ring. Giuseppina’s mother gladly gave her consent, and the young couple got married on the 6th of June of the following year. Their honeymoon in Italy lasted 3 months. It was then stretched out further because they returned to the States by ship, taking the opportunity to go on the first passenger cruise of the Leonardo Da Vinci. They then took a train from New York to San Francisco. During her first 3 months in her new homeland, she was not that happy, even if she said she was. Then things got better when her first child, Anna Maria, arrived. Taking advantage of what she learned in costume design school, Giuseppina started working as a seamstress. She continued working even after Leo and Raymond were born; then, when Peter arrived in 1972, she stopped. At that point, with four kids to take care of, Giuseppina decided to dedicate all her time to being a mother. In 1980 Trentini nel Mondo founded a club in San Francisco. At that time, the President of Trentini nel Mondo, Bruno Fronza, gathered 30 members together and assigned people to various positions: Vittorio Eccher, President, Laura Vitlacil, Vice-president and Ursula Leonardi, Treasurer. Giuseppina was asked to be secretary, and she accepted the position with enthusiasm, that sort of enthusiasm that is part of her nature. Then, only 4 years later, she became president.